After falling behind the competition for the last year or two, Apple has finally plunged into the 4K HDR home entertainment landscape in a very big way. 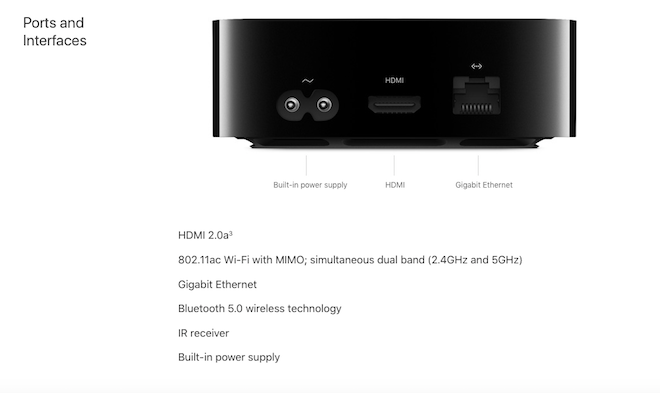 The new Apple TV 4K -- available at $179 for the 32GB model or $199 for the 64 GB version -- is relatively expensive when compared to other 2017 streaming devices and lacks a few key features out of the box, but it's also the first standalone streaming set-top box to support both Dolby Vision as well as HDR10 and will, of course, seamlessly integrate for those who have already invested in the Apple ecosystem of iPhones, iPads, Macs, and various i-accessories. Perhaps the biggest news of all, Apple is already in the process of upgrading its library of HD titles to 4K (in Dolby Vision or HDR10) and they're going to give you access to the higher resolution versions FOR FREE. Plus, Apples 4K HDR movie prices are in the $10-$20 price range whereas VUDU UHD titles were, per studio requirements, locked in a $25-$30 price point even if you'd already purchased the HDX version. In short, it's only been a week and Apple has already disrupted 4K streaming in a fairly dramatic fashion, but does the new Apple TV 4K live up to the hype? The first step is choosing whether or not you need the 32GB or 64GB version. If your primary focus is on streaming movies and television, the 32GB version should suffice. If you plan to get a bunch of apps and even some games, spring for the 64GB model. 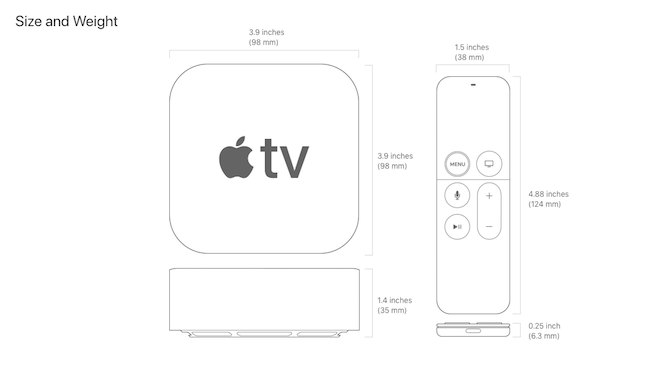 Design wise, the Apple TV 4K looks virtually identical to the previous model. 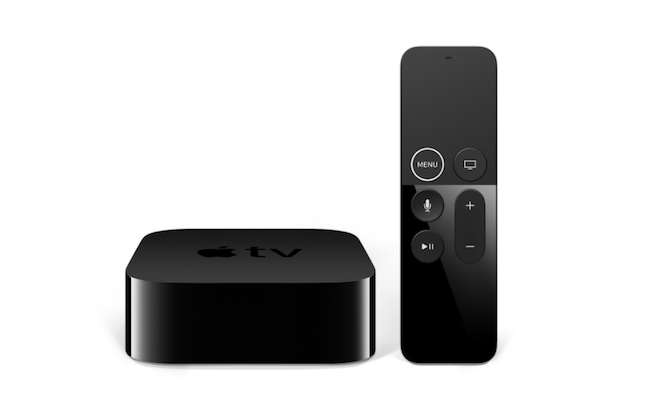 It has a glossy black curved box that comes in at 1.4 x 3.9 x 3.9 inches and weighs approximately 15 ounces. On the front of the device, there is that single white LED light that tells you when the device is powered on. On the back of the unit, there is a power connector, an HDMI input, and an Ethernet port to hardwire your connectivity, which I always recommend. This new Apple TV also has the A10X Fusion chip, which is the same chip that's in the iPad Pro. Yes, it's that powerful. To cope with that much power, Apple has put a circular air vent on the bottom of the unit to keep things cool, and is completely silent when running. 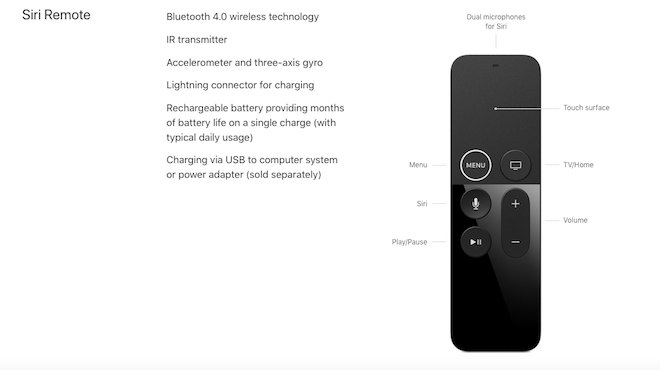 The remote control is virtually the same this time around too, which is the thin 4.9 x 1.5 inch remote that is a glossy black on the top and a silver aluminum on the backside with a touchpad and five buttons. The only difference here is that the Menu button has a white circular ridge around it that should help find the buttons in a dark room. There is also a Mic button, a Play/Pause button, the volume button that works perfectly with any television, and the home button. The remote control charges with a Lightning/USB connector that is included. The interface is also the same as the previous device, which allows you to click on any of your apps from the home screen that you have downloaded from the app store. 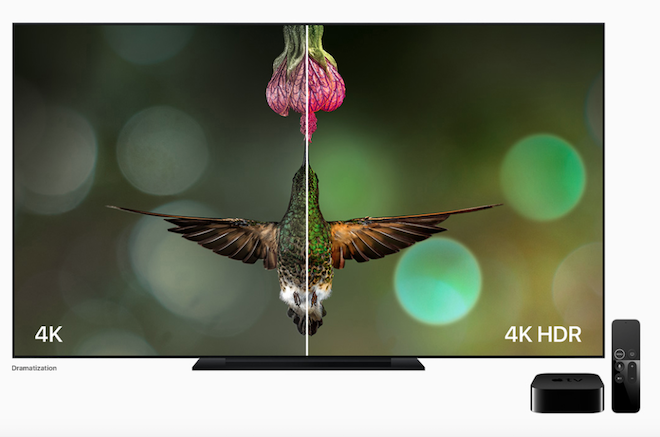 The Apple TV 4K also supports screen mirroring, audio streaming, and Airplay from any of your iOS devices. Siri is also included here, which will answer any sort of question or query you might have. Setup is extremely simple. All you have to do is plug the power cord into a power outlet and plug in your HDMI cable (preferably 4K HDMI cable) into your display and you're all set to go. After adding the language preference and entering your Apple ID, your main menu will appear and you will be able to download all of your previous apps. There is an Apple TV option that allows you to input one username and password, along with signing in with a TV provider that will open up all of your streaming apps without having to enter a password for each app. It's time-saving and easy to handle, due to the excellent on-screen pop-up windows. Setup is extremely simple. Plug the power cord into a power outlet and your HDMI cable (preferably 4K HDMI cable) into your display or AVR and you're all set to go. After selecting a language preference and entering your Apple ID, your main menu will appear and you will be able to download all of your previous apps. Best of all, if you sign into the Live TV app with the same password you use for your cable or satellite provider, you'll be able to skip entering password for each app covered by those subscriptions. It's time-saving and easy to handle, due to the excellent on-screen pop-up windows. Lastly, I'd recommend hardwiring an Ethernet cable directly into the Apple TV 4K. By using and watching the 4K HDR, more bandwidth and usage is required, so it all depends on your network speed and location. If you have the lowest tier of Wi-Fi speed and live in the middle of nowhere, chances are your streaming image won't look perfect. That being said, many of us have good to top internet speeds, therefore connecting using Wi-Fi will look excellent. But with the higher image quality and speed that 4K HDR uses, it's a good tip to hardwire in for the best quality. To discuss the performance of the new Apple TV 4K, we must talk about what it can do and what it can't. Right out of the box, Amazon, Google Play, and Spotify are not available (but should be coming soon). Also, a glaring miss-step for now is that Dolby Atmos and DTS:X are not supported on the Apple TV 4K. With almost every 4K UHD Blu-ray release boasting Dolby Atmos or DTS:X sound mixes, it's staggering to know that Apple has made no mention of supporting these new hemispherical surround codecs (yet). Most other (cheaper) streaming boxes have these options already, but for now, we will have to settle with 5.1 or 7.1 decoded internally and sent to your sound system as PCM. Hopefully, there will be a firmware update that allows for Dolby Atmos bitstreaming. In addition to that, while Disney and Marvel are finally releasing titles on 4K Ultra HD Blu-ray and VUDU UHD, you're still limited to watching Guardians of the Galaxy Vol. 2 in HD if you rent or purchase it on iTunes. Also, even though YouTube has the largest library of 4K UHD HDR video out there, the Apple TV 4K limits YouTube playback to 1080p. And Siri's voice activation, which is great, still requires picking up the remote control, which is a shame in the era of Amazon Alexa. One last flaw -- and I promise we're almost to the things the Apple TV 4K does well -- deals with how the new Apple TV handles HD and SDR content. In trying to give customers the smoothest and clearest picture possible, the engineers have eliminated the ability to switch picture modes and resolutions. This was done to avoid flickering screens and handshake problems, which is admirable and results in a gorgeous interface because your TV thinks it's ALWAYS in 4K HDR, but there are a few problems. First, everything you watch will be upscaled to 4K HDR and not all content upscales well (you might get more colors with too much contrast and grain, for example). Second, Apple TV 4K will default to HDR10 over Dolby Vision if your display's HDR10 refresh rates are higher than its Dolby Vision refresh rates (looking at you, 2016 LG OLEDs)... even though Dolby Vision is a better all around HDR format. Hopefully, many of these grievances will be sorted in the not-too-distant future, but as of right now, the Apple TV 4K is missing a few key features. But it's also a pretty baddass device with a lot of greatness to behold. At the top of this list, it's super powerful and quick. 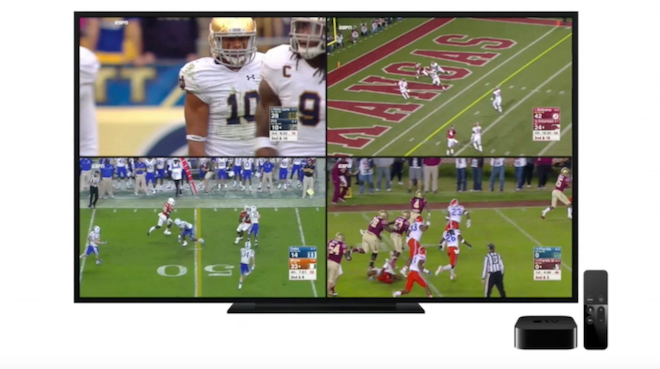 We've already talked about the time-saving login process, but if open up the ESPN app, you'll be able to conjure up four different live games or news on your television screen, and then click on any of them to make them go fullscreen without any distortion or lag time. It's quite impressive and seamless. The video games are great too. An Apple TV is no PS4 or XBox One by any means, but it's fun to play mobile games on the big screen with the Apple TV remote. I tested out Labyrinth, which you play by tilting your remote in various directions, and there was zero lag. I also played the old-school side-scrolling Sega game Sonic the Hedgehog, which looks great in its 8-bit glory. It took a little bit to get the hang of how to play with the remote's trackpad, but I quickly learned and found myself beating levels with ease. I'm going to assume that there will be more complex games coming to the Apple TV 4K app store very soon. When watching any of the 4K HDR films, the image quality was spectacular, rich, and full. For instance, watching Wonder Woman in 4K Dolby Vision through iTunes showcased unbelievably realistic colors with a wider gamut of different shades of blue and red on Diana's outfit. The different colors of smoke in the backgrounds, as well as the fire and brimstone on Ares, are magnificent with every bit of orange and red showing up on screen. Detail was pitch perfect too, with every piece of debris having full detail in every explosion. I just wish there was that Dolby Atmos option here. Right now, the 4K HDR movies are $5.99 to rent and $19.99 to own versus the $9.99 and $29.99 price points established when VUDU first offered 4K. Also, there are a whole bunch of Sony and Fox titles you still can't get on VUDU. And, Apple has made a specific tab for all 4K HDR films, so they're easier to find. The Apple TV 4K is ambitious and has the potential to be the best TV set-top box ever made. However, as we write this, there are several key missing elements that make the higher price hard to justify for anyone who isn't already heavily invested in the Apple or iTunes ecosystem. Especially when one considers that more affordable devices already offer access to these missing features. 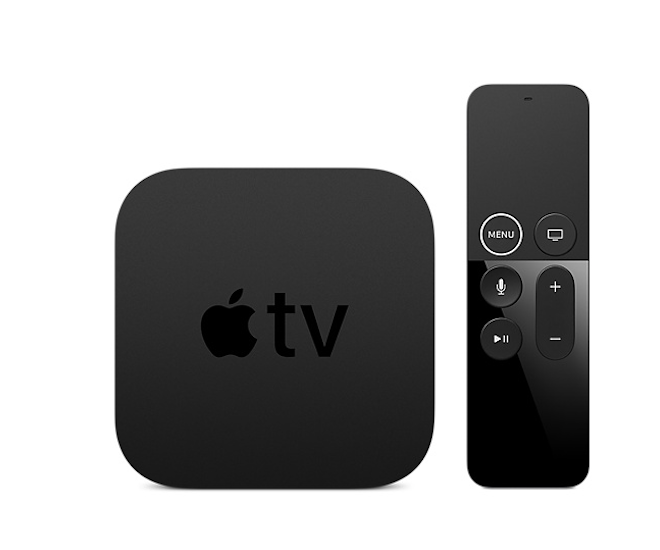 The Apple TV 4K is the fastest and most powerful streaming set-top box on the market and is capable of producing gorgeous imagery and iTunes will soon, if it doesn't already, have the largest selection of 4K HDR titles available to rent and own. To be fair, that's a sizeable What If list, one we can't guaranty becoming a reality, but Apple is never done updating its devices so we'll have to wait and see. Should you buy one right now? If you have a big iTunes library, a 4K display with HDR, and lots of other Apple devices, then, by all means, buy one today and enjoy. Recommended! If you're new to Apple, hate Apple, or were waiting to see if the Apple TV 4K was The Best Streamer Ever, you might want to stick with your display's own streaming apps and hold off to see if the bugs are patched. There's also the XBOX One S to consider. It costs about $50 more and streams 4K HDR content and comes with a 4K player and HDMI cable. Granted, there's no Dolby Vision and the Microsoft interface is not nearly as good, but you're getting more bang for your buck in the gaming department.